You can make a story out of anything. 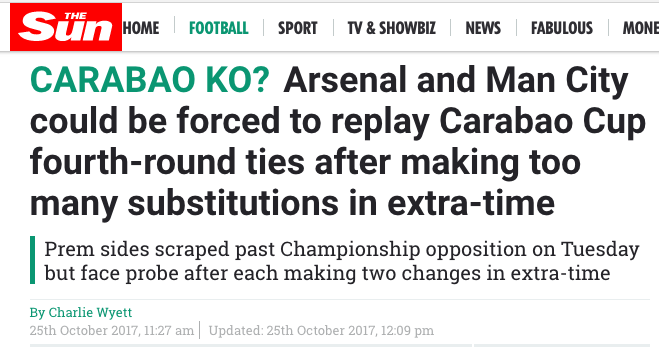 Take the Sun’s news that “Arsenal and Manchester City face disqualification from [the] Carabao Cup”.Why? Well, the Sun says they stand accused of “making too many substitutions in extra-time”. It’s the ‘CARABAO KO”. Arsenal and City have ready-made defences should the matter reach the legal stage. Bristol Rovers, Bournemouth, Brighton Burnley, Brentford, Portsmouth and Cardiff City all made two changes in extra-time in the Cup’s earlier rounds. 10.1 Subject to Rule 10.2, in all matches, each team is permitted up to seven substitutes of whom not more than three may take part in the match. 10.2 Where any match goes to extra time (in accordance with the provisions of Rules 14.4, 14.5 and/or 14.6), then subject to the League having obtained the prior approval of the International Football Association Board (IFAB) to the application of this Rule, each Club participating in that match will be permitted to use an additional substitute (in extra time only). Isn’t new media crap and full of fake news, eh. It’s nothing like the trusty, subjective and truthful old media, is it? (Yes, it is, ed).